The Launch Pad: Flashback Friday Returns! "What Will We Do With the Moon?" Flashback Friday Returns! "What Will We Do With the Moon?" This is an excerpt from an April 1952 edition of Popular Science, written by the legendary Arthur C. Clarke. The combined vision and practicality from Clarke -- 5 years prior to Sputnik and certainly prior to any serious thoughts of moon exploration by the U.S. or Russia -- is astounding. The original article is located here. TODAY we can no more predict what use mankind may make of the Moon than could Columbus have imagined the future of the continent he had discovered. Nevertheless, it is possible to foresee certain lines of development which appear likely as soon as we have reached the Moon, and we can also discuss, in general terms, the problem of making it habitable. The things we are to discuss now will not happen quickly, and some will remain un-accomplished for centuries. But in the end they will be achieved -- unless better, perhaps more fantastic solutions are found. One of the first tasks of the expedition would probably be to erect as tall an aerial as possible. A 50-foot mast would give a radio range of about six miles though this might be greatly extended if the Moon has an ionosphere. Since a spaceship would hardly provide very commodious living quarters, an attempt would be made after the first few flights to build some kind of pressurized building or hut. This would probably be made of reinforced fabric or plastic material, blown up to form a hemispherical chamber and fitted with a small air lock. The whole thing would look very much like an Eskimo igloo, and would probably be silvered for heat insulation. Its inflation would mark the foundation of the Lunar Base. 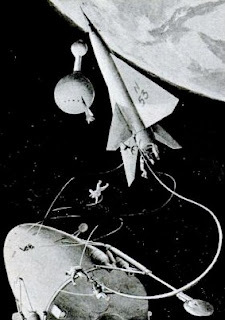 For a considerable time all flights to the Moon would be directed to the same spot, so that material and stores could be accumulated where they would be most effective. There would be no scattering of resources over the Moon's 12 million square miles of surface -- an area almost the same as that of Africa. Where the first landing will be must of course be decided from the preliminary photographic surveys made by robot or piloted rockets. Certainly it will be on the visible side of the Moon, so that the expedition can keep in touch with Earth. Within a few years of the first landing, it should be possible to establish a small camp on a permanent basis, keeping it supplied by a regular service of ships from Earth. A great effort would be made to set up an observatory with a telescope of moderate size: in fact it would be worth while building a spaceship for no other purpose than to carry a reflecting telescope of, say, 20 inches aperture to the Moon. The absence of an atmosphere would mean that it would always be possible to use it to the limit of magnification -- and not on the few dozen occasions a year, at the very most, which is the best that can be expected on Earth. Since the lunar night lasts for 14 of our terrestrial days, it would be possible to carry out many types of observations which cannot be performed on our rapidly spinning planet. Beneath the Moon's black and utterly cloudless skies, astronomers would at last be able to see the stars as they really are. Under its perfect seeing conditions, such vexing problems as the existence of the Martian canals will be solved long before an expedition can reach that planet. When the time came to build really large telescopes, it would be a vastly simpler engineering proposition to do this on the Moon than on the Earth, since the low gravity would mean that a much lighter structure could be used. However, this is looking rather a long way ahead -- to the time when there is a Lunar Colony and not merely a lunar base. Although we cannot expect to discover appreciable oxygen in the free state, it should be remembered that this element comprises more than half, by weight, of the crust of our planet, and whatever materials the Moon may consist of will probably contain it in abundance. Given sufficient power it can, in principle, be extracted. Water is also a common constituent of many minerals, and can be removed simply by heating. On the Moon it would be possible to obtain plenty of heat, during the daytime, by focusing sunlight with a simple arrangement of concave mirrors. However, the sheer physical problem of handling the quantities of rock involved would be considerable. It would simplify matters greatly if water could be found in the free (frozen) state. It is quite possible that it may occur in caves, or on the surface in temporary deposits. Given electrical energy, it could then be electrolyzed to provide oxygen, and the two major problems of life on the Moon would be solved. We may safely assume that by the time lunar expeditions are feasible it will be possible to generate electrical power on a large scale from nuclear sources. The power unit of an atomic rocket would provide ample energy to run turbines and generators. 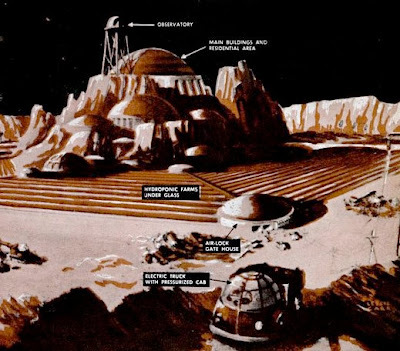 There is a good deal to be said for moving the Lunar Base underground at the earliest opportunity, if it proves possible to excavate the Moon's surface rocks without too much difficulty. An underground settlement would be easy to air- and temperature- condition, and its construction would not involve carrying materials from Earth. After air and water - perhaps even before - the search would be for material from which rocket fuel could be obtained. Water amy again provide the answer. It is a possible (though not the best) propellant for atomic rockets. Electrolyzed to provide hydrogen and oxygen, it could drive conventional chemical rockets. Once it became possible to refuel on the Moon, the whole picture would change and the economics of space flight would improve by a factor of 10 or more. A spaceship leaving the Earth has to attain a speed of 26,000 miles an hour in order for it to "coast" to Venus by the most economical route. If it left the Moon, the starting speed would have to be only 7,000 miles an hour because of our satellite's much lower gravity. If large supplies of fuel can ever be obtained on the Moon, it would become the key to the Solar System. Space ships making any interplanetary journey would, on departure and arrival, refuel there. They would probably not land but would orbit the Moon while specially developed short-range ferry rockets brought fuel up to them. ... We cannot say whether the future population of the Moon is likely to be a few score scientists -- or millions of men and women living comfortable and, to them, quite normal family lives in huge, totally enclosed cities. Since conventional flying machines obviously cannot operate on the airless Moon, long-range lunar transport presents something of a problem. Rockets would almost certainly be uneconomic for short distances, and it appears quite likely that railways would be extensively used. Pressurized vehicles with large balloon tires would also be employed for much the same duties that they fulfill on Earth. Their motors would be electric, operated by storage batteries, or else turbines, drive by reacting rocket fuels, either directly as in a gas turbine, or indirectly through the use of some intermediate fluid.